For many, the idea of digging up a huge gold nugget is something only found in Western movies or in history books. However, there are still places out there that produce nice gold just like in the old days. Ganes Creek, Alaska is one of these places; and for many years it was a destination for hundreds of gold prospectors hoping to find gold nuggets with a metal detector. Between 2002 and 2012, Clark-Wiltz, the controlling owners of the property, operated a pay-to-mine operation that allowed people from all around the world to pay a fee to search for gold in their older, closed down and “worked out” areas. Quite often, people would find substantial gold in the tailing pipes of what was left behind by the dredges. Located in the south-central region of Alaska about 25 miles west of the town of McGrath, the Ganes Creek property is one of the largest privately owned patented possessions of land in the state. 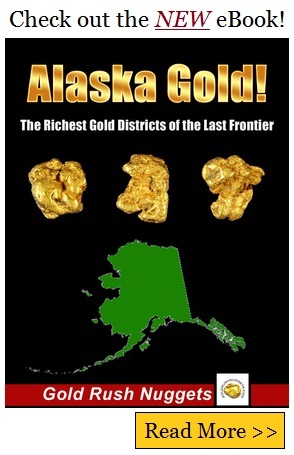 With 90 Federal and 238 state mining claims, the property covers over 12 miles of Ganes Creek where some of the biggest gold nuggets in the State of Alaska have been discovered. In a state known for producing some of the biggest nuggets ever found in the United States, that is really saying something. The Ganes Creek area is accessed thanks to a gravel road that connects to a barge landing. The property itself has been improved over the years to include a runway large enough to handle planes as large as C-130s. The living quarters on site can hold up to 30 people at one time. The equipment alone is valued at several million dollars showing what kind of investment has been made into the mining operation over the years, and the potential of the creek and surrounding area. Since the Ganes Creek area was first opened up for gold mining, it is estimated that over 250,000 ounces of gold have been mined from the property. This includes many large gold nuggets that were mined through dredging, draglines and bulldozer operations. During the ten years that recreational gold prospectors were allowed to metal detect there, many more ounces of gold nuggets were recovered. It is estimated that nearly $800 million dollars-worth of gold is still waiting to be found on this property, and undoubtedly some of that gold is in the form of some huge gold nuggets. Sadly, the pay-to-mine operation that allowed prospectors to come in with metal detectors and search for large gold nuggets is no longer a part of the operation. If you ever spent time on the various gold prospecting forums, it was always fun to hear stories about the big nuggets that were found each summer by the various prospectors that visited the property.